"What's important to me is the theme, as we are having our wedding in Japan in October and we will be wearing the wedding kimono on the day. i will be wearing a black top (just like the picture) and black/white vertical stripes bottom. 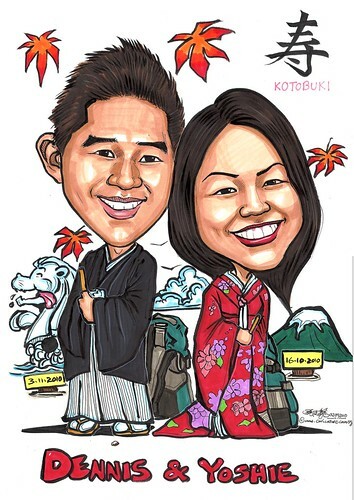 She will be wearing a red kimono (quite similar to caricature2. i would need those details in the picture, as well as the sign 'Kotobuki' on the top right is also important as it is used only in Japanese Weddings. We also like the Autumn leaves as it will be Autumn when we have our wedding in October. I intend to use yr picture as our welcome board for both our weddings in Japan and Singapore! Hope the information above helps in anyway possible. I also attached a few more pictures for your reference..."